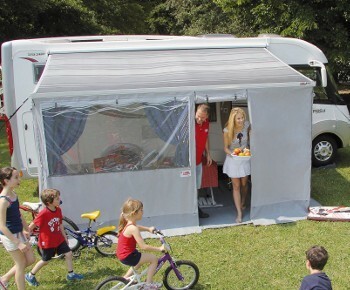 A complete set of side and front panels, with framework, to make a complete enclosure for Fiamma F45 awning canopies. The Privacy Room Light is made from lighter weight material than the standard Fiamma Privacy Room and the rear vertical rafters are not included to reduce weight. Fiamma Privacy Room Light is an enclosure for Fiamma F45 awnings with a range of sizes with a special version for F45 260 fitted to vans at heights between 180cm to 220cm and a range to suit awning lengths from 300 to 400 fitted at heights from 225cm to 280cm. Because it is not supplied with rear vertical rafter, the side panels of the Privacy Room Light are fitted with elastic ropes and quick hooks so it often provides a better seal for F45 fitted to vans with curved walls. 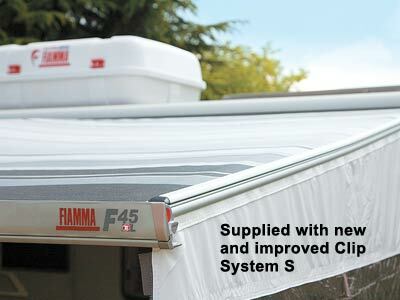 Optional Fiamma Kit Poles Light can be purchased to better seal panels against flat walls of a motorhome if required. 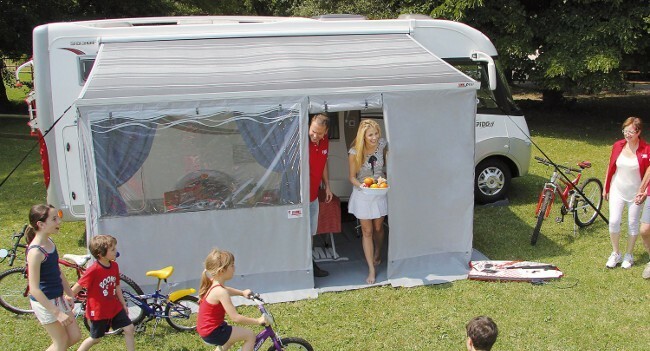 It is suitable for most generations of Fiamma F45 including F45 i, F45 Ti and F45 S models, and comes with adapter kit so it can perfectly fit to Omnistor* and Tristor* awnings. 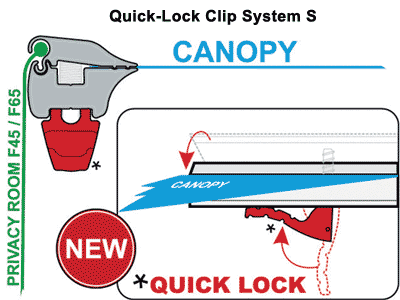 *Adapter kit allows installation on Omnistor 4900, 5002 and 5003 models and Tristor 2 awnings. Fiamma no longer supply Curtains with the Privacy Room. Please make sure to buy these as an optional accessory if you require them. Video shows full first installation of Fiamma Privacy Room. Some stages will not be required after first installation. 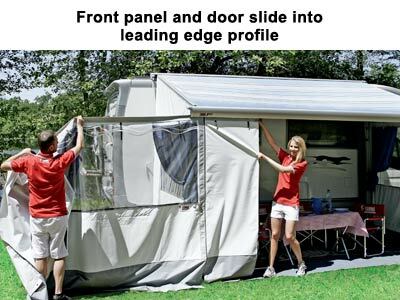 The front panel fits by sliding in to the channel on the awning lead bar and the component panels are interchangeable so you can have the door and windows on either side. 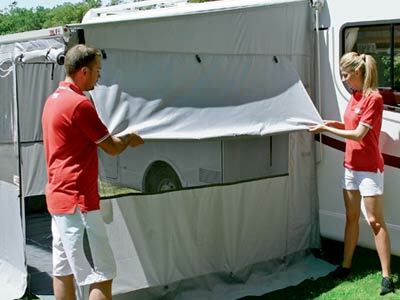 The front panel has a large, openable crystal window with mosquito net and 2 x curtains are supplied for privacy. 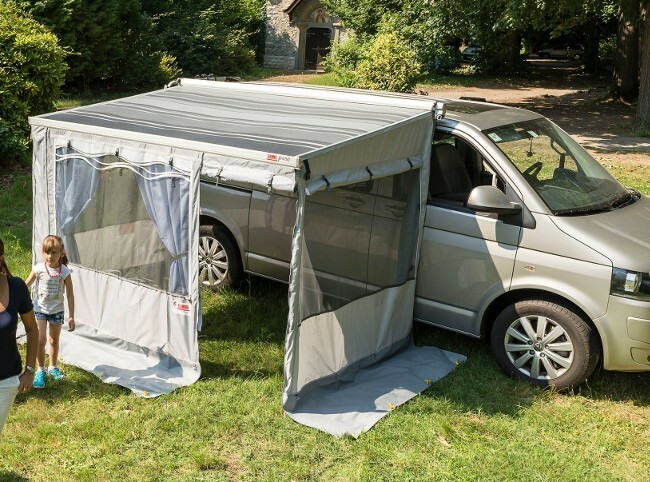 All panels are made from lightweight, durable grey polyester and the front and side panels zip to each other to give a complete seal on all sides. Fiamma Privacy Room Light is supplied with everything required to fit to Fiamma F45 i, F45 Ti and F45 S awnings as well as Omnistor 4900, 5002, 5003 and Tristor 2 models. 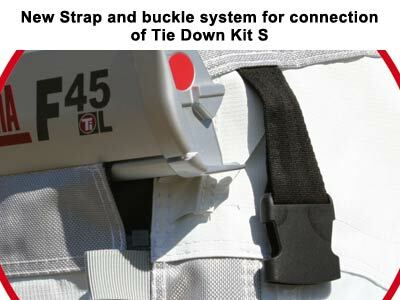 It will not fit to F45 Plus or older versions. To select the correct version Privacy Room Light for your awning canopy, you need to measure your awning installation. Measurement A is the length of the awning case attached to the side of your vehicle. 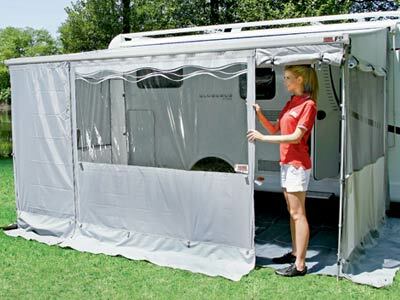 Measure the awning box and NOT the canopy fabric. 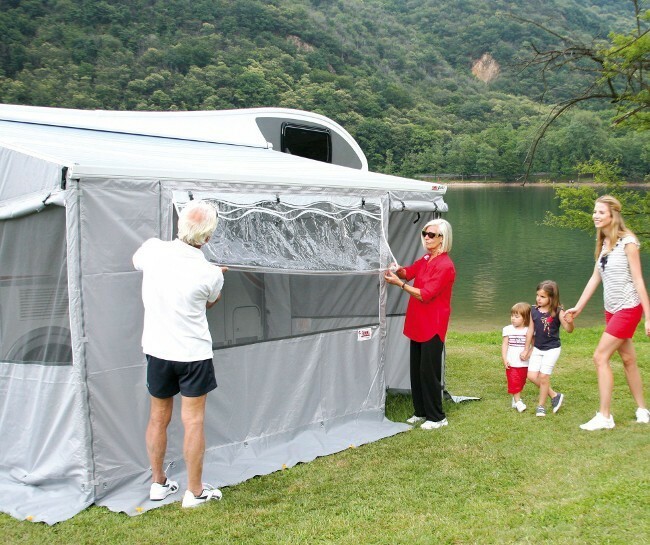 Choose the Privacy Room length which is the closest match to your awning case measurement. 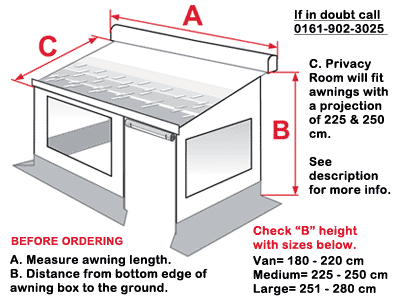 Measurement B is the height from the ground to the BOTTOM of the awning case. 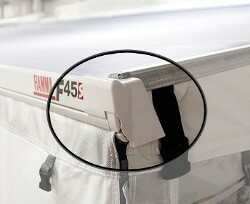 Measure both ends of the awning case as one end may be higher than the other. Also, consider whether you will raise your vehicle on ramps when on site as this may effect the size you should choose. 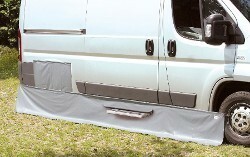 *Van height only available for 260 length awning. Select the appropriate height and length from the lists above. The price will change as you make your selection. 1 x front panel with door and window. 2 x side panels with windows with moskito net. Installation kit for F45 versions & Omnistor 5002 / 5003. Storage bag Mega Bag Light.